Software for control of h/p/cosmos® treadmills, visualization and recording of parameters on h/p/cosmos treadmills functions: Definition of individual test profiles. - Graded test, free profile, ramp, heart rate profile. - Manual control and manual record mode. - Automatic control of h/p/cosmos treadmills. - Monitoring of test parameters and subject's heart rate. - Storing of test data and curves. - Export function to h/p/cosmos para analysis. - Export function to Microsoft Excel / .csv-format. Personal Computer or laptop / notebook with Pentium® 800 MHz Processor or higher. installed operating system Windows® 2000 / XP / VISTA. min. 512 MB RAM, min. 200 MB free memory on HD. VGA-Monitor min. 800 x 600, CD ROM drive. free RS232 interface port for connection of any peripheral equipment. converter (converter-cable 1 m, h/p/cosmos order# cos12769) is available at h/p/cosmos (use only converter types, which are approved by h/p/cosmos). for control via USB interface the processor must be Pentium 1.8 GHz or higher. RS232 interface cable (e.g. 5m order# cos00097010034) for connection between the ergometer and PC. incl. software h/p/cosmos para graphics®. incl. 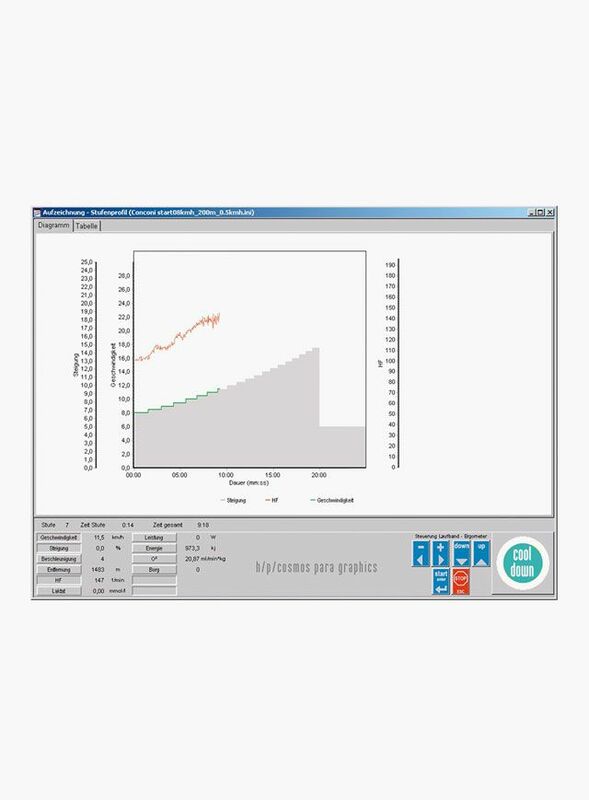 demo-version of h/p/cosmos para analysis® lactate analysis software.